Another year has come and gone, which means it is time for me to look back at what I've purchased. If you'd like to look at last years' superlatives, you can click here. This year, only 35% of my wardrobe was purchased secondhand, which is a bit down from last year. The single store/website that I purchased the most items from was Nordstrom Rack (16 items) and my most purchased brand was Rag & Bone (8 items). I ended up going about $100 over my budget (although I did buy a wedding dress this year, which was a one-time purchase and caused the total budget to grow above what I'd normally expect it to be). I did save a whopping 81% off the retail price of my clothing (up from last year)! (For anyone wondering how I calculate that number, some clothes - like from Nordstrom Rack, still have the tags so you can see what the retail price was, and for items that are secondhand, I do a google search to try and locate the exact item, but take a guess when necessary, based on comparables). The Future: In looking ahead to 2018, I'd like to increase my second-hand purchases to make up at least a majority of my total overall purchases. I said that last year too, so I guess I want to try to actually achieve it this year. There are a lot of good second-hand and vintage stores in the Bay Area, some of which I already know about, but I bet there are even more, waiting to be discovered. Also, I honestly like mostly everything I bought in 2017 and there isn't anything currently that my heart desires. Usually there is a specific item, or a general category that I want to tackle, but right now I feel pretty content. My plan is to try to capitalize on that feeling and do a better job of organizing and displaying my clothes, so that I remember what is in there. One of my favorite things about the spreadsheet is that it is always a good reminder about what is in my closet, and what (if I see it on the sheet and haven't thought about it for a whole year) should probably go. 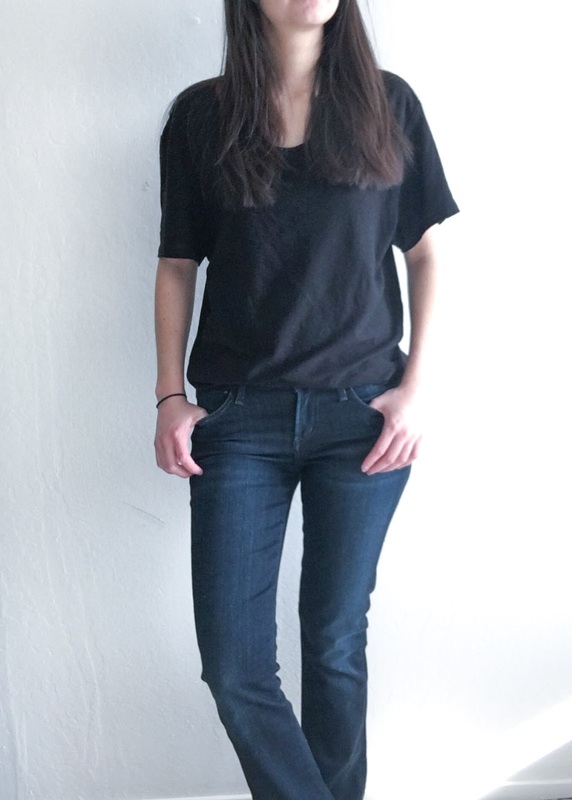 I've written a little bit about this tee before, but really, it checks all the boxes for me as the perfect shirt for work or the weekend: soft fabric, neckline that isn't too low, and not too large nor too skin tight. It was an in-person Nordstrom Rack find, and was priced down to a highly reasonable $24.98, before tax. It is so nice I hunted it down online (for a less reasonable $39.99) and bought it in blue as well. Actually, everything in this outfit, other than the necklace and shoes, was a 2017 purchase. I bought this in person, so it wasn't like it was a surprise online order, but this romper did not end up being practical. 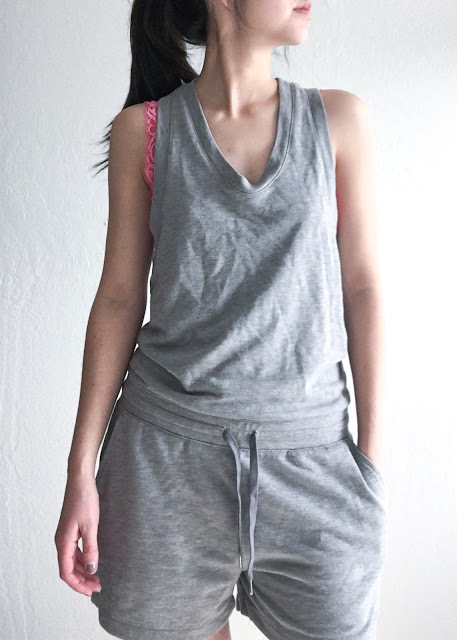 It is deliriously soft but also quite warm - making it uncomfortable to wear when it is actually warm enough to wear shorts, yet not quite warm enough to wear when it is cold. I've started sleeping in it, but only on nights that are the perfect temperature, and think I probably could have passed on this purchase. A small part of me is considering cutting it into a casual tank, and sleeping shorts. This is actually still for sale at Nordstrom Rack (affiliate link). For reference, I took a size 00. This navy, metallic-flecked dress was one of my first purchases of 2017, and is one of my favorite dresses. It is soft and romantic and looks great when I spin. I wore it to a wedding (but sadly did not take any photos) and plan to keep wearing it to more weddings and formal events in 2018 (and take a picture this time...). My weakness in 2017 appeared to be sizing. I generally liked everything I bought, but I got the sizing wrong a few times. I think jeans tripped me up the most - sometimes they are a little tight in the dressing room and it doesn't bother me for the 2 minutes I am trying them on, but then once I wear them all day (usually while sitting, as opposed to standing in the dressing room) it turns out they do not fit. Towards the end of the year I started to automatically go up a size in my jeans, to avoid this in the future. This pair of Paige jeans were from their Petite line, and ended up being too small and were donated. They don't look egregiously tight in the photo below but the waist band was uncomfortable. This dress, on the other hand, is too big. It is a silk Eileen Fisher dress (don't mind the wrinkles), and I talked myself into it because I love the color. I thought there would be a way I could belt it, but it has pockets, which puff in a weird way when it is belted. I also thought there would be a way I could just wear it in a cool over-sized way, but I was mistaken ☺. Off-the-shoulder tops and dresses were a big trend in 2017, and I was pretty hesitant to partake in it. Most OTS tops are either too tight, and dig into your skin, or far too loose, causing you to tug at them all day. No one was more surprised than me when I grabbed this one at an Amour Vert sample sale and it was exactly right. 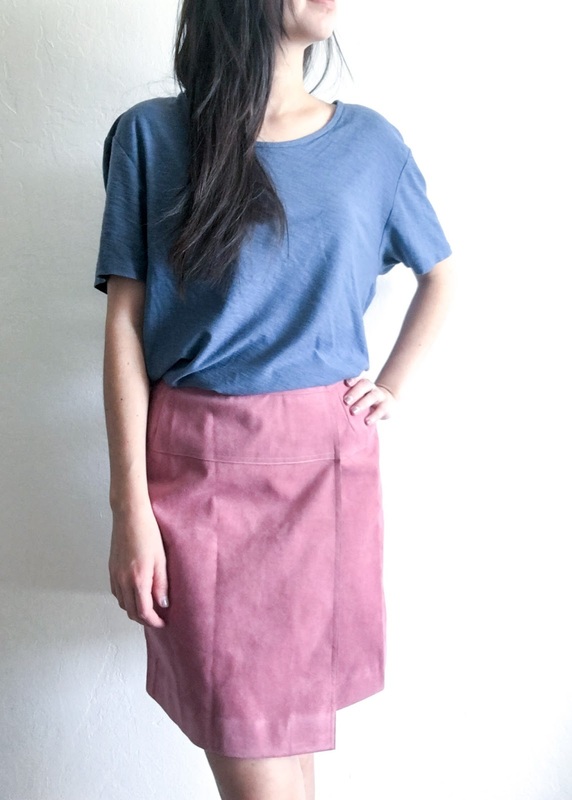 I also love how the three-quarter length sleeves balance out the exposed shoulder. 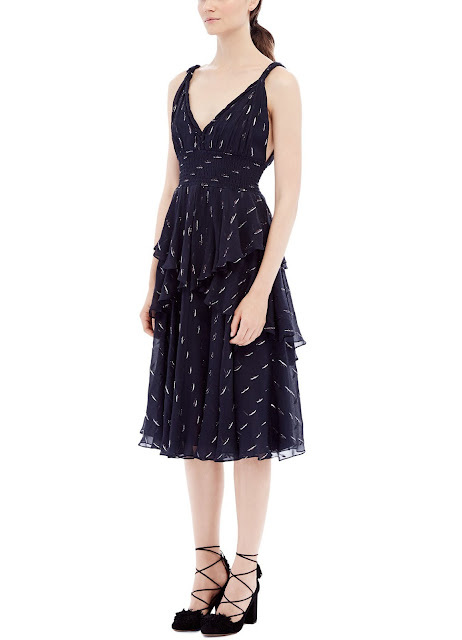 Over the last few years, I have found that looking and waiting is often the best way to find the clothes I want at a discount (This is Exhibit A. Read on for Exhibit B). 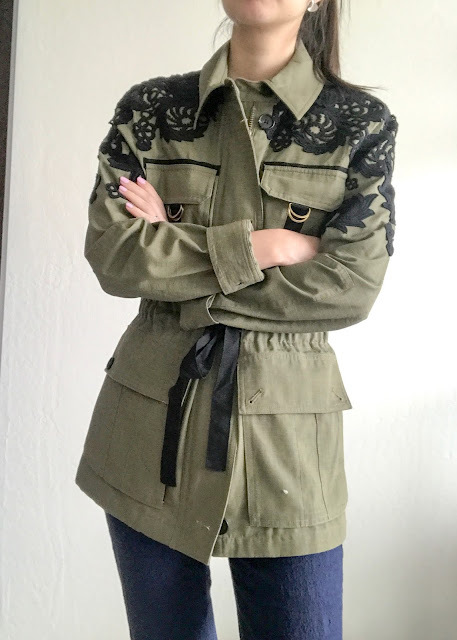 I lusted after this jacket for probably almost a year, watching it not go on sale and sell out anyway, and then re-stock, and then not go on sale again, only to have it finally be discounted and sell out. It has a fun and unique pattern, but it is also a $700 unlined utility jacket, so there was no way I was going to pay full retail, or frankly buy it at 50% off, and I really thought about doing a DIY version (and frankly, still might look into it). Somehow, there was one that fit me on the clearance rack at a SF Nordstrom Rack, that no one else grabbed first. I'm glad I waited and the discount fashion gods decided to smile down upon me. Well there you have it. Tell me, what were your best and worst purchases of 2017? Anything you plan to change in the new year? As always, thanks for stopping by! Happy new year! The Rebecca Taylor dress is beautiful, and I see your discussion of the one Eileen Fisher not-so-good purchase that you mentioned at my blog. 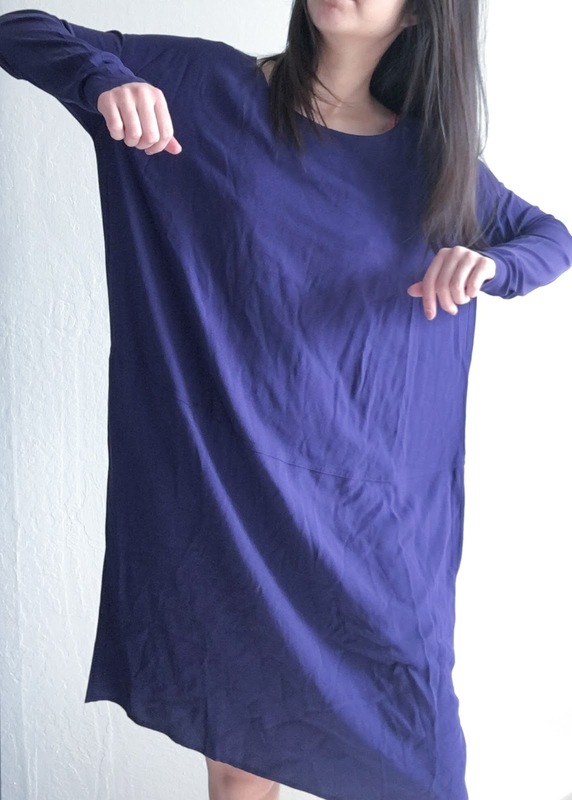 I often find myself tempted by the idea of the intentionally more dramatically oversized-looking clothes (which are common in the Eileen Fisher and Elizabeth Suzann lines, I feel like) though I'm sure I couldn't actually pull it off. Happy New Year, Xin! I always appreciate your thoughtful comments! Also, have you tried any Elizabeth Suzann? I feel like I am seeing them more and more but don't really know anything about the line.